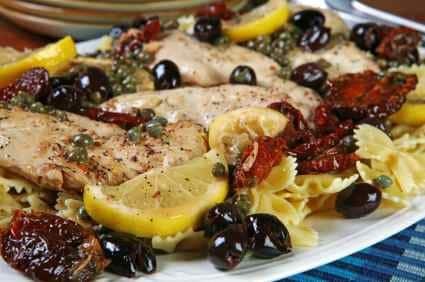 Home » Chicken Recipes » Black and Blue Chicken – combines both black olives, and blue cheese along with a boneless skinless breast. Black and Blue Chicken – combines both black olives, and blue cheese along with a boneless skinless breast. Our recipe for Black and Blue chicken was submitted by another viewer of the website. Vernalissa sent us this recipe, so often we buy boneless and skinless chicken breasts, but we are all looking for something new and creative this recipe is for you. Blue cheese, black olives, and fresh basil help make for a new take on something that we all serve. This combines both black olives, and blue cheese along with a boneless skinless breast. Cut slit in the thickest part of the chicken breast. Season the chicken with salt and pepper. Mix together blue cheese, olives, and basil. Stuff the mixture into the chicken breast (use a toothpick to hold chicken together). Fry on each side in olive oil until chicken is no longer pink, about 20 minutes.